It’s interesting to see that #39 is one of those numbers that’s continually in service. While it’s had a few long-term wearers, such as Hrabosky and Larry Jackson (1955-62), it’s had its travels as well. The last 20 years it has been reserved for the coaching staff, mainly by McKay but for one year (1998) by Dave Parker and the last three seasons by friend of the Conversations With C70 podcast Pogue. The last player to wear it? Cory Bailey. The last player you remember wearing it? Probably our subject for today, Mr. Tewksbury. Tewks was always a fun person to watch. The control of Greg Maddux (without quite that level of success), Tewksbury seemed to go years without walking someone and was the staff ace at a down time in Cardinal history. 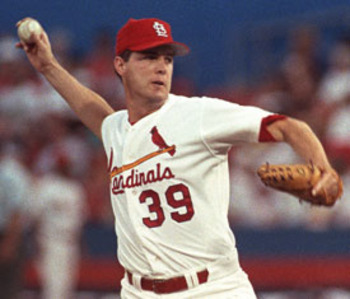 His only All-Star season came in 1992, when he went 16-5 with a 2.16 ERA and when he walked only 20 guys in over 200 innings. That kind of control is always fun to watch and I think he’d have been a great match with Dave Duncan when he came along, but sadly they missed each other by a couple of seasons. I also remember Tewksbury being an accomplished artist and he was also one of the more intelligent players in the game. His uniqueness was emphasized after he retired, as he is now a sports psychologist for the Boston Red Sox. While he might not be the most famous New Hampshire pitcher the Cards have ever had, he definitely made his mark in Cardinal history.